Background: Tumor budding was defined as a single cancer cell or a cluster of fewer than five cancer cells in the stroma of the invasive tumor margin. It has been suggested as a prognostic factor in various cancers, such as esophageal, lung, colorectal, and endometrial. There are only a few studies about the prognostic signifi cance of tumor budding in laryngeal carcinomas. Materials and Methods: A total of 81 patients with laryngeal carcinoma diagnosed between 2011 and 2016 and treated by partial or total laryngectomy were evaluated. Clinicopathologic parameters were correlated with the presence and grade of tumor budding. Results: The study was consisted of 77 (95.1%) male and 4 (4.9%) female patients. The mean age of the patients was 60.2 years (min: 42 and max: 78). Median follow-up time was 25 months (min: 7 and max: 54) (SD ±11.5). 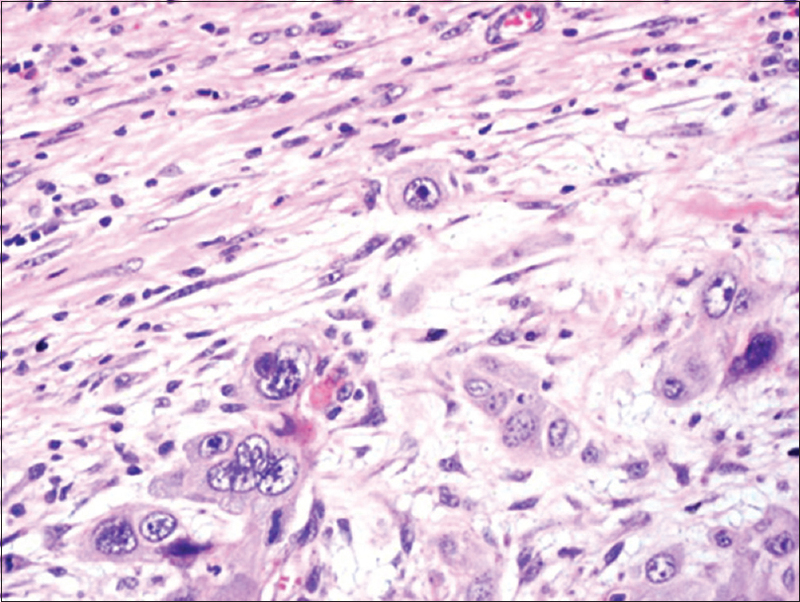 Histopathologic diagnosis was squamous cell carcinoma (SCC) in all patients. Of the 62 cases showing budding, 2 (3.2%) were stage 1, 12 (19.4%) stage 2, 16 (25.8%) stage 3, and 32 (51.6%) were stage 4. Fifteen cases with budding (24.2%) showed lymphovascular invasion (LVI). None of the nonbudding cases had LVI and perineural invasion (PNI). Statistical analysis revealed that LVI and PNI were signifi cantly associated with budding (P = 0.017 and P = 0.012). Among the tumors showing budding, 37% had lymph node metastasis (LNM). In nonbudding cases 15% had LNM. There was a statistically significant correlation between LNM and budding (P = 0.017). None of the parameters correlated with grade of tumor budding statistically. Conclusion: The results of this study suggest that tumor budding might be used as a prognostic factor in laryngeal SCCs. Tumor budding has been defined as the presence of isolated single tumor cells or small cell clusters in the stroma at the invasive tumor margin. Initially, Morodomi et al. defined tumor budding in 1989 and then it has been reported as a prognostic factor in various cancers in English literature.,,,,, In this study, the relationship between tumor budding at the invasive tumor margin and clinicopathologic parameters were investigated in the laryngeal carcinomas. A total of 81 patients with laryngeal carcinoma diagnosed and treated between 2011 and 2016 were evaluated. Patients were treated by partial or total laryngectomy. Age, gender, tumor stage and lymph node stage, type of surgery, number of metastatic lymph nodes, extracapsular extension, treatment scheme, recurrence, and distant metastasis were determined from the hospital records of the patients. Hematoxylin and eosin (H&E)-stained slides of the patients with SCC were revised by two different pathologists. Isolated single tumor cells and clusters composed of fewer than five cells identified at the invasive margin at any of the sections were defined as budding foci, as previously described [Figure 1]. The presence and extent of budding was evaluated using light microscopy at high magnification (×400). The degree of tumor budding was classified into three grades: mild, <1/3 of the entire invasive margin; moderate, 1/3–2/3; marked, >2/3 as stated by Kanazawa. The statistical relationship of budding with morphologic and clinical parameters, stage, metastasis was evaluated by performing Chi-square test, Mann–Whitney U-test, and Fisher's exact test. Multivariate Cox regression analysis of tumor budding, necrosis, lymphovascular invasion (LVI), surgical stage and lymph node metastasis (LNM) were performed. A P value of <0.05 was considered statistically significant. The study consisted of 77 (95.1%) male and 4 (4.9%) female patients. The mean age was 60.2 years (min: 42 and max: 78). Median follow-up time was 25 months (min: 7 and max: 54) (SD ±11.5). Pathologic diagnoses were SCC in all patients. Three (3.7%) cases were stage 1, 20 (24.7%) stage 2, 19 (23.5%) stage 3, and 39 (48.1%) stage 4. Recurrence was present in 1 (1.2%) case. All cases (100%) were alive. Necrosis was present in 13 (16%), LVI in 15 (18.5%), and perineural invasion (PNI) in 12 (14.8%) cases. Twenty-six cases (32%) showed LNM. Extracapsular extension was observed in 11 (13.6%) cases. Lymph node dissection did not perform in six cases [Table 1]. Budding was identified in 62 (76.5%) patients. The number of cases with mild, moderate, and marked scores of budding were 27 (33.3%), 16 (19.8%), and 19 (23.5%), respectively. 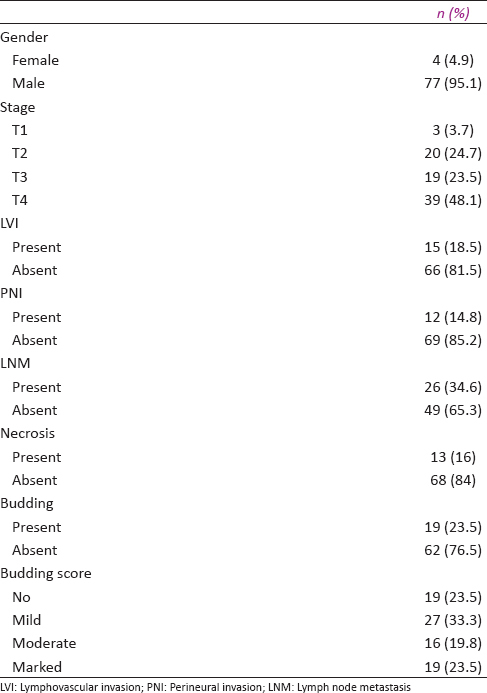 Grade of tumor budding was not statistically associated with LNM, LVI, and tumor stage [Table 2]. Among the 62 cases showing budding, 2 (3.2%) were stage 1, 12 (19.4%) stage 2, 16 (25.8%) stage 3, and 32 (51.6%) were stage 4. Incidence of budding increased with the advanced stages but the correlation between budding and stage was not statistically significant. Necrosis was present in only one (5.1%) nonbudding case. Of the cases which have budding, 12 (19.4%) showed necrosis. There was no statistically significant difference between tumor budding and necrosis. Fifteen cases with budding (24.2%) showed LVI and 12 cases with budding (14.8%) showed PNI. None of the nonbudding cases showed LVI and PNI. Statistical analysis revealed that LVI and PNI were significantly associated with budding (P = 0.017 and P = 0.012). Among the cases showing tumor budding, 37% had LNM. In nonbudding cases, 15% had LNM. Budding and LNM had statistically significant correlation (P = 0.017) [Table 3]. There was no statistically significant correlation between tumor budding and extracapsular extension (P = 1). Only one case showed tumor recurrence. In this case, tumor budding, necrosis, LVI, PNI, and LNM were not present. No statistically significant relation was found between tumor budding, necrosis, LVI, PNI, LNM, and disease-free survival (P = 0.073, P = 0.65, P = 0.62, P = 0.66, P = 0.47). The presence of tumor buds has been considered as a characteristic feature of aggressive cancer. It has been previously demonstrated as a valuable prognostic marker for colorectal carcinoma. More recently, it has also been reported as a significant prognostic marker for patients with esophageal cancer, lung and ampullary adenocarcinoma, and laryngeal cancer. Tumor budding is a histopathological finding defined as the presence of small cell clusters composed of <5 cells at the invasive tumor margin. This feature is not only identified at the invasive tumor margin but also at the superficial and deep portions of tumors showing aggressive behavior, along with well-known carcinogenesis steps, such as destruction of the basement membrane or loss of intercellular adhesions. Budding seems to be associated with the nuclear location of b-catenin, which is related to E-cadherin aberrations, along with loss of the expression of epithelial cell adhesion molecule (Ep-CAM). These changes are caused by the loss of intercellular adhesions. Prognostic significance of tumor budding in colorectal carcinomas was studied in a large number of studies. It has been reported that budding is a histopathological finding that is related with poor prognosis, LNM, and locoregional recurrence in various series.,, Koike et al. suggested the prognostic significance of tumor budding in esophageal SCC and showed a correlation between tumor budding and lymph node metastases, venous invasion, depth of tumor, and intramural metastases. Tumor budding was significantly associated with T1 stage, tumor architecture, and LVI in bladder carcinomas in a study of Fukumoto et al. They emphasize that tumor budding may be a novel indicator for predicting stage progression in T1 bladder cancers and may be introduced in clinical practice. There are only a few studies about prognostic significance of tumor budding in head and neck malignancies. Nandita et al. evaluated oral SCC and found that high intensity of tumor budding and deeper invasive depth correlated with reduced overall survival. They emphasize that tumor budding is easy to identify and reproducible. In routine diagnosis, the number of tumor budding cells can be determined and the patients can be categorized into high-risk group and low-risk group and this classification may provide optimal treatment. In a series of 233 early-stage oral tongue cancer, Almangush et al. showed that depth of invasion, tumor budding, and pattern of invasion have prognostic value and should be mentioned in pathology report. Although budding has been proven as a prognostic factor in various cancers, there is only one study that mention the prognostic significance of tumor budding in laryngeal carcinomas. Sarioglu et al. evaluated 64 laryngeal carcinoma patients with a diagnosis of SCC consisting of 93.7% males, with a median age of 56 years, which is a similar population with the present study. Total laryngectomy was the most common procedure and budding was classified as none, mild, moderate, and marked in their study. Marked budding was identified as a prognostic factor by univariate analysis for distant metastasis-free survival and in multivariate analysis, the number of metastatic lymph nodes and budding were significantly associated with distant metastasis. They suggest that budding might be a valuable prognostic factor, particularly for distant metastasis in laryngeal carcinomas. 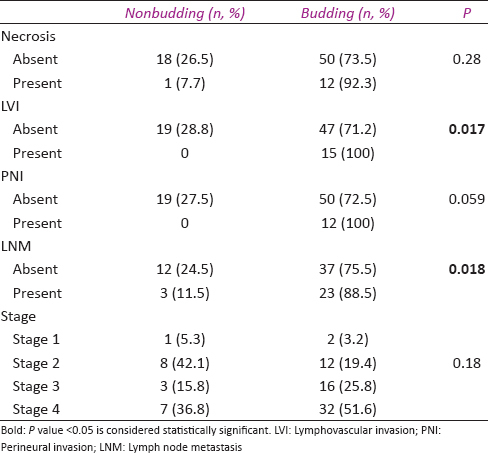 In the present study, there was a statistically significant correlation between budding and LNM, LVI and PNI also, but no statistically difference was observed between grade of tumor budding and prognostic parameters. Although the correlation between budding and stage was not statistically significant, incidence of budding increased with the advanced stages. Almangush et al. reviewed the databases of PubMed, Scopus, and Web of Science for articles, which studied tumor budding in SCC of the head and neck region. The findings of these reports suggested a strong association between tumor budding and tumor progression, in addition to a strong correlation with patient prognosis. They concluded that standardization of the scoring method and cut-off point of the risk stratification is necessary before the incorporation of tumor budding in pathology reports during daily practice. There are only a few studies about the prognostic significance of tumor budding in laryngeal carcinomas. In the present study, the statistically significant correlation between budding and LNM, LVI, and PNI supports the prognostic value of tumor budding in laryngeal SCC. Tumor budding as an adverse prognostic factor might be used to categorize the patients into risk groups. It is easy and reproducible to interpret H&E-stained tumor sections by light microscopy, hence pathology reports may include information about the presence or absence of tumor budding to predict prognosis of patients with laryngeal carcinoma. Agaimy A, Weichert W. Grading of head and neck neoplasms. Pathologe 2016;37:285-92. Lin HW, Bhattacharyya N. Staging and survival analysis for nonsquamous cell carcinomas of the larynx. Laryngoscope 2008;118:1003-13. Morodomi T, Isomoto H, Shirouzu G, Shirouzu K, Kakegawa K, Irie K. An index for estimating the probability of lymph node metastasis in rectal cancers. Lymph node metastasis and the histopathology of actively invasive regions of cancers. Cancer 1989;63:539-43. Sarioglu S, Acara C, Akman FC, Dag N, Ecevit C, Ikiz AO, et al. Tumor budding as a prognostic marker in laryngeal carcinoma. Pathol Res Pract 2010;206:88-92. Kanazawa H, Mitomi H, Nishiyama Y, Kishimoto I, Fukui N, Nakamura T, et al. Tumour budding at invasive margins and outcome in colorectal cancer. Colorectal Dis 2008;10:41-7. Sert Bektas S, Inan Mamak G, Ciris IM, Bozkurt KK, Kapucuoglu N. Tumor budding in colorectal carcinomas. Turk Patoloji Derg 2012;28:61-6. Koike M, Kodera Y, Itoh Y, Nakayama G, Fujiwara M, Hamajima N, et al. Multivariate analysis of the pathologic features of esophageal squamous cell cancer: Tumor budding is a significant independent prognostic factor. Ann Surg Oncol 2008;15:1977-82. Fukumoto K, Kikuchi E, Mikami S, Ogihara K, Matsumoto K, Miyajma A, et al. Tumor budding, a novel prognostic indicator for predicting stage progression in T1 bladder cancers. Cancer Sci 2016;107:1338-44. Unlu M, Cetinayak HO, Onder D, Ecevit C, Akman F, Ikiz AO, et al. The prognostic value of tumor-stroma proportion in laryngeal squamous cell carcinoma. Turk Patoloji Derg 2013;29:27-35. Akman FC, Dag N, Ataman OU, Ecevit C, Ikiz AO, Arslan I, et al. The impact of treatment center on the outcome of patients with laryngeal cancer treated with surgery and radiotherapy. Eur Arch Otorhinolaryngol 2008;265:1245-55. Gosens MJ, van Kempen LC, van de Velde CJ, van Krieken JH, Nagtegaal ID. Loss of membranous Ep-CAM in budding colorectal carcinoma cells. Mod Pathol 2007;20:221-32. Choi HJ, Park KJ, Shin JS, Roh MS, Kwon HC, Lee HS. Tumor budding as a prognostic marker in stage-III rectal carcinoma. Int J Colorectal Dis 2007;22:863-8. Tadahiko M, Matsuoka H, Sugiyama M, Abe N, Sakamoto A, Atomi Y. Actual number of tumor budding as a new tool for the individualization of treatment of T1 colorectal carcinomas. J Gastroenterol Hepatol 2006;21:1115-21. Sohn DK, Chang HJ, Park JW, Choi DH, Han KS, Hong CW, et al. Histopathological risk factors for lymph node metastasis in submucosal invasive colorectal carcinoma of pedunculated or semipedunculated type. J Clin Pathol 2007;60:912-5. Nandita KP, Boaz K, Srikant N, Lewis AJ, Manaktala N. Tumour budding: A promising parameter in oral squamous cell carcinoma. Res J Pharm Biol Chem Sci 2016;7:2059-63. Almangush A, Bello IO, Keski- Säntti H, Mäkinen LK, Kauppila JH, Pukkila M, et al. Depth of invasion, tumor budding, and worst pattern of invasion: Prognostic indicators in early-stage oral tongue cancer. Head Neck 2014;36:811-8. Almangush A, Salo T, Hagström J, Leivo I. Tumour budding in head and neck squamous cell carcinoma – A systematic review. Histopathology 2014;65:587-94.